Vas: Perhaps I am not so clever. I have tried several random numbers and have only limited success in finding oddities. One could successfully write countless unique equations to fit every constant or random number and call it an oddity. It is difficult however to find oddities using only the basics such as prime numbers, Fibonacci sequence and the Pythagorean triplet. No equations or complex algorithms are used in Document A. What makes it even more odd and interesting is that pi, the square root of two and S have several interwoven oddities. There are also two interesting blocks, one at E-3 and the other at E-4 (see alphanumeric locators on the sides of Document A). If you are correct all numbers lets say from 0000000001 to 9999999999 should have oddities similar to pi. Why does 0000000001 and 9999999999 lack oddities which includes Fibonacci, geometric and prime numbers and the like which are easily found in the first ten digits of pi? Why do numbers near pi have none or very few oddities? Question: You could come up with those silly oddities from any irrational number, its just the way they have been manipulated. Vas: Keep in mind that pi is not any irrational number but the most popular constant. No, there are not infinite possibilities as only the start of pi, the square root of two and S are considered. In the infinite landscape of irrational numbers there are all kinds of oddities in fact an infinite number of oddities. God as well as humans know this. This is why God put the oddities right up front in pi. If the oddities appeared in the infinite reaches of pi we would expect it as stated above that "in the infinite landscape of irrational numbers there are all kinds of oddities in fact an infinite number of oddities." My thinking is that God intentionally created the oddities up front so that they would be noticed. To repeat, if the oddities appeared farther in pi they may never be noticed and if they were found they would be considered as a normal occurrence as in the infinite reaches of pi all kinds of oddities in fact an infinite number of oddities appear. Question: Ignoring the zero there are 4 primes from 1 to 9, in other words 44%. In the first 20 digits of pi there are 9 primes which is 45%. What makes you think there are 'so many primes' in pi? Vas: Though low value prime numbers are easily found in all facets of mathematics, prime number sequences are not so easily found naturally and this is why prime numbers are an important part of SETI research. Why are there so many prime numbers in pi? 25% of numbers under 100 are primes. In pi there are 31, 41, 59, three primes in a row and 314159 is a prime and so is the reverse 951413. To make things more interesting, 31 per Homewood, 41 per Euler and 59 per Ulam can be used to generate many prime numbers. 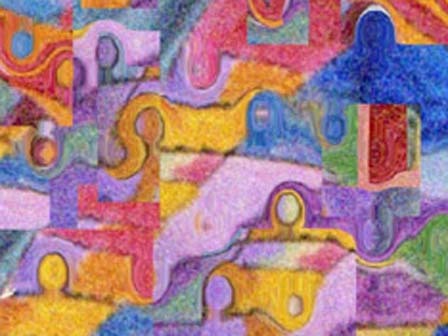 see http://www.artmusicdance.com/vaspi/highlights.htm . Question. It's also pretty much coincidence that we are using decimal notation. I transformed the decimal notation of pi = into octal notation and did not detect any prime number oddities. So it doesn't seem that pi was numerated by God. Vas: You are right the pi oddities are absent from the base of eight. In addition to the base of eight the pi oddities are also very likely absent from most of the other of infinite base notations other than ten. Apparently God prefers the base of ten and this may be the reason we have ten digits on our hands. One day someone may prove that it is impossible to have simple oddities in all of the infinite base notations. Perhaps even God cannot perform the impossible miracle of including as many as nineteen oddities in all of the infinite base notations other than ten. I must admit that this is the toughest issue facing my thesis however the answer I provide if not adequate is sufficient if all the oddities are valid. Question: I find only the 6 digit reversed prime comes anywhere close to being interesting. The rest of the oddities are too mundane to be noteworthy. Vas: That you find only one interesting oddity out all that are illustrated in Document A is ok. I too do not find all the oddities equally interesting. The strange numerations of pi can be labeled 'oddities' 'interestings' or 'mundanes'. Call them whatever you like. That they are, that they exist in pi, the square root of two and S is the central issue. It is normal that all the oddities are not equally interesting. Question: It seems that you intentionally tried to find oddities in pi. Vas: Once I noticed the 3_4_5 right at the start of pi I slowly developed an interest in pi. Obviously and I cannot remember when, I looked to find more oddities in pi. So you are right, that is exactly what I did! I picked the interesting and ignored the mundane. And even more obvious is if I had no such objective no oddities would be found at all and hence Document A would not exist and therefore I would not be replying to your comment. Question: If God numerated pi then why is the cube root of 31=3.14138... which is within .00675% of pi and not exactly 3.14158...? Vas: You may also ask why 22/7 equals pi within 0.04025% and not equal it exactly. I focus on stating that which I have discovered and that which exists. What God could have done or what He should have done is a matter of speculation. Perhaps even God has some limitations? Just guessing here. Perhaps in doing so some undesirable side effects presently unseen by us may enter the scene. Again guessing. Perhaps the "cube root of 31=3.14138..." should be removed from the oddities list? Question: What do you mean by pi being the first constant? What do you mean by pi being the most popular? Vas: I am not sure why humans and perhaps other races in the Universe have such fascination with pi. There are many fascinating theorems involving pi, which is one of the two most important transcendental numbers (the other being e). Pi shows up unexpectedly in many different branches of mathematics. It is the most dissected and analyzed of all the constants. This may be true as it is historically the earliest of known contestants. Let me suggest that you go online and perform a search on the subject. Question: It was also a matter of sheer coincidence that the ratio chosen was the circumference to the diameter rather than the circumference to the radius, which would be 6.283185307... and where would your oddities be then? Vas: I am reporting what I see in the three constants. It is fact. Let me guess that God knew that we would pick 3.14159… instead of 6.28318...? Just a guess on my part! God numerated the three constants so that we will know that a high intelligence did so artfully and conclude that God exists. Anything beyond that at this juncture is guess work. What He should have done is speculation at this point. Question: I find the oddities interesting but not significant. In other words the oddities do not prove that God numerated pi. Vas: There are just too many oddities on our most common and simple constants whereas they are generally absent from random numbers to be labeled insignificant. If it were not for God numerating pi to include oddities pi would very like be like most random numbers, without any artful oddities. What is it that out of the ordinary will prove to you that God exists? Perhaps a cloud in the shape of "pi = 3.14159" circling the earth will convince you? If not then nothing will. The oddities described herein about pi, √2 and S is that cloud. It is indeed very interesting that pi has so many strange happenings or oddities as you call them. In the realm of possibilities the ball (oddities) must land on a blade of grass. In your case it landed on unique red blade of grass (pi). It seems to me that God guided the ball rather than circumstance. Question: You don't really believe that the patterns or oddities in pi, √2 and S are real. Do you? Vas: The faces in this sketch are not really there just because they look like faces. Just being sarcastic here to those that say that the oddities in pi are not really there. I am imagining things. If you can point to them then they are there! Correct? Are the faces here by accident or design? It is obvious that the creator put them there to be seen by those that see rather than just look. 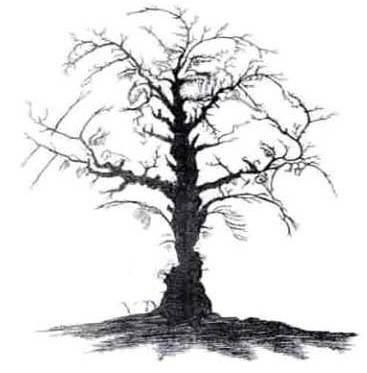 In actuality there are three trees, the pi tree, the √2 tree and the S tree, oddly all have faces. Furthermore their roots are intertwined and oddly make even more faces. Vas: Pi is the most popular universal constant and therefore all intelligent life in the universe can become aware of the oddities and their significance. These are not the basic oddities but a short summary. A. 3_ 4_ 5 Pythagorean triplet in pi and 1_1_2 in identical positions to the decimal point. C. 314159 and its mirror image 951413 are both prime numbers? D. 31 by Homewood, 41 per Euler and 59 per Ulam can be used to generate prime numbers. E. √2 starts with the Fibonacci sequence 1_1_2_3 in which 11, 23 and 1123 are primes. Question: Why is Document A and the highlights not considered numerology. Vas: One way by example is to show you what numerology is. I included some numerology humor for laughs. I hope you find it funny. see: On a Humorous Note (S=886226925) and the two items below On a "Telephone Note" and "On a Musical Note (S=886226925)"
Question: What are the ways to strengthen or weaken the proposition that God numerated pi, the square root of pi and S? Vas: Here are a few ways to help determine the validity that God numerated the three constants as illustrated in Document A. 1. It will hurt the proposition if it was shown that most or even many random numbers have as many simple oddities as pi, the square root of two and S. It will help the proposition though more difficult to prove that random numbers generally do not have oddities or are not as interesting as the one illustrated in Document A. It will help the proposition if the three randomly chosen numbers do not have interweaving oddities. 2. When or if Alpha31 is confirmed it will strengthen the proposition. 31 must yield 39.9% or better to be considered as a valid candidate which can generate primes. Note: in early 2009, 31 was was found to be very productive in generating prime numbers. Details. 3. If some human can numerate pi (near 3.1) more artfully than God this will weaken the proposition. Question: Does the Document A offer proof or is it faith? Vas: Some people may find it difficult to believe that Document A illustrates the evidence that proves that God exists. Perhaps they may not truly fathom the scope of the primary belief that God is nearly or totally omnipotent. Even if they believe in the grandness or infinity of God's power they however cannot allow themselves to progress to next logical step that He can do what ever He wants including to numerate pi as He pleases. For them whether the Expanded Highlights has five or five hundred oddities is of no consequence. So for one to look at Document A with an open mind they must first believe that God can numerate pi as He pleases. After all God made our existence, our universe, so any little tweak would be child’s play. I am saying He numerated pi at 3.14159... so that we will notice the extraordinary oddities that could only have been inserted intentionally and therefore know that God exists. Up to this point no-one has provided evidence that will disprove that God numerated pi. The oddities illustrated in Document A provides the evidence which makes it more convincing than all the rebuttals combined. There are no errors present in Document A and the Expanded Highlights. As Sherlock Holmes once put it, that if you eliminate everything that is impossible, what you are left with is the truth, no matter how strange it may be. I however do not find it strange that God would want us to know with certainty that He exists nor the method He chose. So in conclusion consider what Holmes said to help you determine the relevance of Document A and the Expanded Highlights.